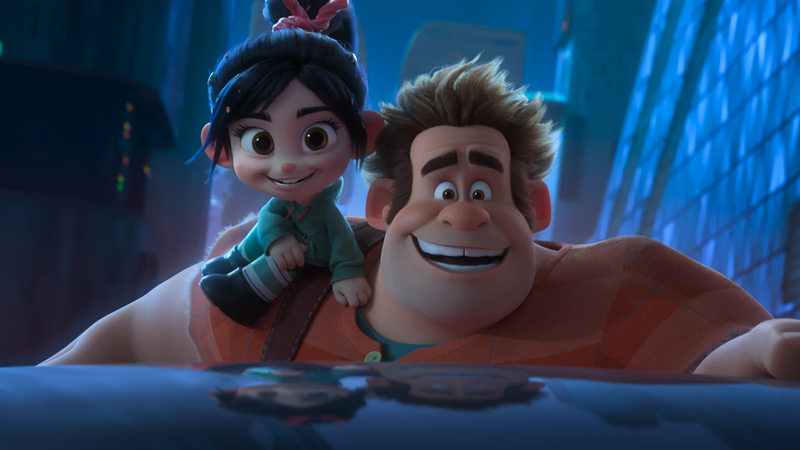 Ralph Breaks The Internet, the sequel to Wreck-It Ralph, has our hero leaving the safety of his arcade game with pal Vanellope and venturing into the internet itself for a fast-paced adventure. It’s been six years since Wreck-It Ralph – how soon after the movie came out did you start thinking about a sequel? I really believe a sequel should only be made if you have the right story to tell. When we finished the first one, someone asked Rich Moore and Phil Johnson who made the first one together ‘do you think there’s another story to tell?’ They went away for probably three or four months before they came back with the idea of the Internet. Initially they said no: ‘I feel like we’ve explored the world of the arcade and video games,’ and we had done that. But it wasn’t until a new world came in that they started to think there could be another story to tell. At that point we started to really develop the idea. At one point in time after they were developing it for a while, Rich Moore actually jumped onto Zootropolis to work with Byron Howard , then when Zootropolis was finished Richard jumped back in with Phil and they started to develop it, so that’s one of the reasons the six years has passed in terms of the first one to this one. There were elements of Starship Troopers, Alien and Tron in the original Wreck-It Ralph, so what movies influenced you for Ralph Breaks The Internet? It is the story of two characters who are the best of friends who are going to start to realise that their friendship may mean it needs to grow in a way where they live apart, so Superbad was actually a movie we looked at very closely from the standpoint of ‘well, that’s a movie about two characters who are best friends who are hitting that point in life where one may go away to college and one may not,’ so it was really something that kind of that kind of sat with us from that standpoint. We certainly look at it as a reference to say how do you think about that element, how do you emotionally tell that story and how do you get the audience to be engaged with it. Were there any technical issues to overcome with this film? In the past there have been issues with things like fur and hair and snow – was there anything unique to this film you had to overcome? There were a couple of things. One is, the crowds are massive in this film because we need to make it feel that there are all these users online all the time so that’s in and of itself a big complex piece. The second part is we go to so many parts of the Internet and we have all of these characters so just the design… If you think about the princesses themselves, you have to build all of them for this one scene. You’ve got Ebay, we need to have Ebay have it’s own look and feel, we go to Buzztube, the character Yesss and the team that she works with has her own look and feel so that creates another layer of complexity within it. One of the biggest ones actually is figuring out how do you put signage throughout the entire Internet in a way that feels a digital, that’s moving, that’s not just a blank sign that doesn’t change, it needs to feel like it’s active as the Internet is itself so you have to create all those signs, you have to animate all those signs and you have to figure out, and the team’s done an incredible job, a piece of software that will actually placed those signs in the world of our shots and actually have them come to life. The immense size of what the internet is was probably one of the biggest things our team had to go off and accomplish. The scene with the princesses in the movie is the one everyone is talking about. Did you know they were going to be so popular? I think we knew at that time as it got pitched that it had the potential if executed correctly to be something that people would really respond to, enjoy and help kind of define a little bit of the film. I think when people see it they’re going to realise how it fits in. It’s not just a moment where we stop and have fun with the Disney princeses, it really does help tell the story telling. We might bring the princesses back in some other part of the film, you might maybe see them because we feel like it’s one of those things, that could fit in quite nicely and would be a big surprise, hopefully, for the audience. You got many of the original voice actresses back for the scene – was that difficult to pull off? We got all the original voices back to do the princesses and I’ve got to say it was probably one of the most amazing parts of my career. I never thought that I would actually be on a movie that would have all of them together. It was a surprise. I think what was so great about it was when they came in to record, after they did the recording session we would have them meet with the animation team to talk about their character, because for a lot of these animators they had never actually worked with these specific princess characters and when they talked about what it meant to them, being this voice, it was very emotional to hear that even 20, 30, 40 years later, for them, it was a defining moment in their life and they still felt connected to that character and they really, really deeply cared. As we were evolving the scene we said to them ‘think about how your character would actually do this’. They were given lines and gave a direction but we said ‘you’ve got to do it within the character that you know’ and they just had a blast doing that. And then last year at D23 we actually had all those female actresses come up on stage, a couple couldn’t make it, but basically everybody else was there. It was a really crazy moment but it was awesome. Truly amazing to meet all of them. Were any of the princesses harder to recreate for the movie than others? I think Pocahontas is not easy because of the fact you’ve always got to have her hair flowing and make sure that that’s right. Rapunzel is always a difficult character because she has all that hair so then it becomes about staging and how do you do it in a way that makes if feel like you see the hair but you don’t see all of it so there’s a complexity to that side of it. Really the most difficult thing is that all of them have completely different clothing and hair and that means a lot of work for the rigging team to actually be able to make it look very realistic in terms of CG. So they are all, in their own ways, complicated to recreate. You’ve always worked in animation, what is the appeal for you? When I was a kid my grandparents owned a movie theatre. I loved movies, so when I initially moved to Los Angeles I just wanted to be part of a big studio. I didn’t really think specifically about animation but I got this incredible job at Disney and after a couple of years I could see what incredible work the animation group was doing at Disney. I joined in 1990 so it was during the Little Mermaid, Beauty and the Beast period and I joined Disney Animation around the time of the Lion King. For me I think I thought of it originally ‘this is just going to be a great area to go explore and then I might do live action’. But what I didn’t realise was just what a great community it is. What I love about it is there are 900 people at Disney Animation, it’s like one family. We all make movies together. I made Lilo And Stitch and Bolt and Wreck It Ralph and Zootropolis and now this sequel and I’ve made it with some of the same people who are still there and there’s something so great about it. And the people come from all over the world. They bring their experiences to that table and so for me, that’s what excites me. While there was initially that thought of ‘of course one day I’ll do live action,’ I will never leave animation now. But I just think it’s this incredible opportunity to tell great stories that will get seen around the world because it is animation and can have an impact on people. Of all your films, which would you say you are most proud of, and why? Can I give you two? So, Lilo And Stitch I’m very proud of because it was my first movie. So for me, to get to the end, succeed and not fail, because I’ll be honest with you, but if you’re doing it for the first time you think ‘do I really have it in me to do this?’, was an incredible experience. It was also a hand drawn film and one of the last big ones done by Disney animation so I have a huge affinity for that aspect of it and an appreciation for that art and that work. Zootropolis is one of where I will always feel connected to that story. When it originally got pitched ‘what if we did a story about the concept of bias using two groups – predator and prey – I thought, ’I have to be a part of that’ and I begged to be on the movie because I just wanted to be a part of that storytelling. It was a very tough story to figure out so the journey was long but it was incredibly rewarding. So for me that will always sit in my heart as one of my favourites animated films. So where do you keep the Oscar you won for Zootropolis (for Best Animated Feature)? Ralph Breaks The Internet opens in the UK on Friday 30th November and is on general release in the US.